Chemical fires and explosions are very dangerous hazardous situations and can cause entire towns or cities to evacuate. The treatment, storage, and disposal of hazardous storage or hazardous wastes are heavily regulated by the Environmental Protection Agency and other regulatory agencies to prevent harm from people and the environment. Many hazardous fires start from improper storage of hazardous materials. Hazardous materials: Defined by the EPA, are considered any dangerous or potentially harmful substance that can harm human health or the environment. Hazardous materials can be considered flammable, poisonous, corrosive, combustible, explosive or unstable. Hazardous storage facility by US Chemical Storage. There are many potential hazards when dealing with hazardous materials. Health hazards are the most serious, which can involve many different threats, from headaches and rashes to cancer, organ damage or even death. Environmental hazards are another type of very serious risk when dealing with hazardous materials. Environmental hazards not only hurt the environment, but can also hurt organisms and animals who live in the environment, including humans. A major spill of a harmful chemical can pose dangers to many people and the environment if it gets into the water supply. Proper containment of hazardous materials can decrease potential risks to human health and environmental health. There are many different classifications of improper hazardous material storage including the storage of hazardous materials near incompatible substances, storing hazardous materials in a non-fire rated storage facility and not using proper chemical storage maintenance accessories. These improper storage practices can lead to potential hazardous situations and can cause serious threats to human health and life. 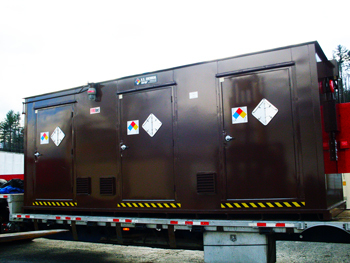 Store hazardous materials in a fully enclosed hazardous storage facility for maximum safety and security. A hazardous storage facility provides a completely sealed, grounded structure for storing hazardous materials or hazardous wastes compliantly. US Chemical Storage offers fire-rated or non-fire rated hazardous storage facilities for storing flammables inside or outside of your facility. When storing hazardous materials in a hazardous storage facility you can be sure that your storage will remain compliant. US Chemical Storage offers a wide variety of customizable accessories for maintaining your hazardous storage safely. When storing flammables or combustibles, depending on geographical location, it is necessary to use temperature controls to keep your hazardous materials stable. There are many potential risks when storing hazardous materials so proper maintenance and management becomes necessary. Alarm systems, liquid level sensors and mechanical ventilation systems can be necessary when storing unstable hazardous materials. Get compliant with a hazardous storage facility by US Chemical Storage. Constructed from heavy-gauge steel for superior strength and reliability, while featuring a 15 year structural warranty.